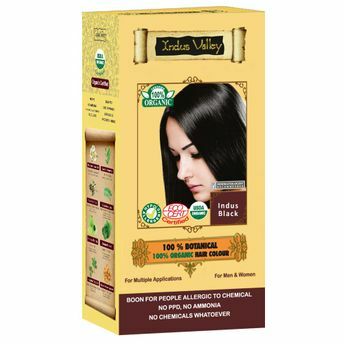 Indus Valley 100% Botanical Organic Healthier Hair Color Indus Black is made up of 8 certified organic herbs. Certified Herbs like Amla, Indigo, henna, Chemomile, Fenugreek seeds, Rubia Cardifolia, Neutral Henna & Brahmi Leaves gives colour & helps to removes hair problems like dandruff, hair fall dryness, premature graying. Regular uses of 100% Botanical 100% Organic Indus black hair colour helps in re-growth & adds volume to hair, helps in making hair shiny, bouncy and healthier & cover your grey hair into Black. Suitable for the people having more than 40% grey hair. 2 pouches of Powder A 60gm and B is 60 gm, Instruction leaflet, Applicator Brush, Gloves, Shower Cap. Alternatively, you can also find many more products from the Indus Valley 100% Botanical Organic Hair Color range.